For this beer review, I thought I’d start at the very top of the heap … at least the top of the heap in most beer aficionado’s minds. This beer is, for many, the holy grail of beer. Perhaps this is because it is such a tremendous beer, by its own merits, but I’d wager it’s really at least in part the fact that this beer is so very rare and difficult to come by here in the U.S. In fact, you can’t buy it in the States and this is by design. For that matter, you can’t buy it anywhere else in the world either … except for one location. 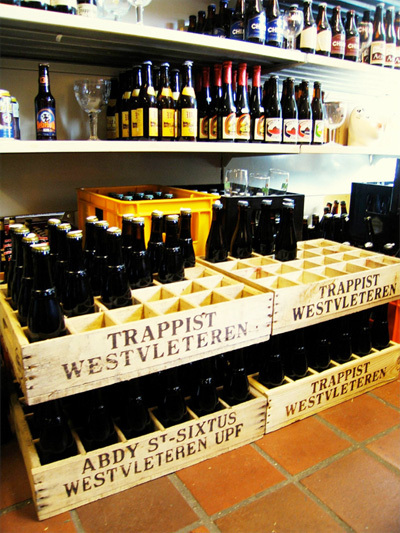 Being the most enigmatic of the seven (yes, only seven) authentic Trappist breweries in the entire world (six of which are in Belgium), the monks of St. Sixtus of Westvleteren brew their beer for their own consumption and for limited sale out of the monastery brewery only. They strictly forbid retail sales of their beer. In this rare case, commercial success and the notion of market share doesn’t apply. The monks brew in order to sustain themselves and their monastery – nothing beyond that is of concern. Not exactly the business model most breweries would adopt, but then … this isn’t most breweries. Pours a deep, rich medium brown color with sherry red accents and a voluminous light tan-colored two finger head. The head dissipates fairly quickly only to be reawakened with a gentle swirl of the glass. A considerable amount of yeast flecks are visible as well, in suspension, even though the bottle was poured carefully and cellared upright. Heavy streaks of lacing are evident in the large goblet into which this rare ale is poured. The nose is outstanding – sweet fruits, Belgian yeast, and a slight spiciness. Very rich and inviting. Reminiscent of a good dubbel on the nose. The palate doesn’t disappoint in the least either … sweet roasted malts, exotic fruits, and the finest Belgian yeast flavors. Starts out quite sweet then yields to more complex fruity and spicy phenolic notes. This beer is exceedingly complex and is obviously meant to be savored. Mouthfeel is medium with a very pleasing alcohol warmth lingering on the tongue. Finish is on the dry side despite the sweet beginnings. This beer is only mildly acidic, yet zero bitterness. The hop presence is stealthily disguised behind the malty goodness and only reveals itself in the fact that this beer is not cloying. Masterfully balanced for the style. What can I say … it’s Westy 12. So much has been written about this beer by those much more eloquent than me. You really just don’t get any better than this. Obviously at the very top of my list. Overall, one of the top beers in the world and certainly one of the most difficult to come by. Excellent in every way imaginable. Believe the hype. Intrigued? A lot of beer lovers are. Is Westvleteren 12 the very best beer in the world, though? Depends. For some, it is. For others, its mystique is its real appeal. Regardless, it’s hard to argue that this Belgian treasure is one of the very best beers you’ll ever have the privilege of drinking … if you can get it.